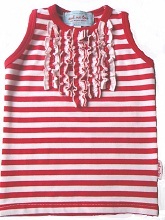 This sweet ruffle front t is an essential peice for a little girls wardrobe!� It is great with shorts, jeans and skirts and the elastane content makes it really comfortable and ensures the garment retains a perfect shape.� Very cute�worn under the AND ME TOO�cardi! Gentle machine wash, line or tumble dry. Warm iron. Sizes�1, 2, 3, 4,�6, 8, 10 and 12.